E.B. 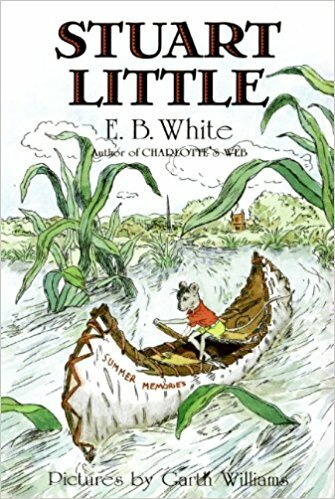 White’s classic tale Stuart Little is about an extraordinary, diminutive mouse. 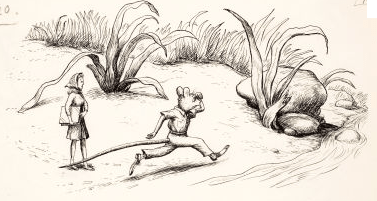 Stuart has a tenacious spirit that emboldens him to confront all the challenges a two-inch mouse naturally faces and some very surprising adventures. Stuart’s human family loves and accepts every inch of him. His size allows him to help his family in a number of ways. He is able to recover stray ping pong balls that roll under the furniture, assist with a sticking piano key from inside the piano, and he even recovers his mother’s ring that accidentally goes down the drain. Of course his size naturally presents challenges as well. Simply washing up in the morning is impossible without improvising some clever devices. One day he is unintentionally closed up in the refrigerator for a time because no one notices him. Then there is Snowball, the family cat, that instigates other problems and complicates a few serious episodes for Stuart, but he seems to patiently deal with some of these issues. He is so adventurous he has no problem leaving the house and facing the world. He even participates in and wins an exciting boat race in Central Park. Stuart’s last adventure is a mixture of loyal friendship, secrets, danger, and new beginnings. Soon after his time in the refrigerator, the family finds a very sick bird named Margalo and nurses her back to health. She and Stuart become wonderful friends. She even saves Stuart’s life when he is accidentally picked up by the garbage man and almost dumped into the East River. It does not take long for Stuart to begin to see Snowball as a threat to Margalo’s safety. One night he actually saves her life from the cat. Then Margalo is told about a conversation between Snowball and another cat and their scheme to harm her. She decides the best plan is to leave, and so she does. Stuart is heartbroken and decides to abandon the life he knows with his loving family and find her – quite a feat for such a small mouse. While constantly traveling north, Stuart encounters helpful people and experiences new situations. His determination does not waver even though he realizes the chances of finding Margalo are nearly impossible. The story ends with Stuart continuing his quest because the journey’s experiences are just as important to him as the goal of finding his dear friend. Through all of Stuart’s adventures, he definitely does not let his size or the world stop him. He is loyal to his family and Margalo and friendly and open to everyone he meets. Stuart willingly embraces novelty and the promise of future experiences unfolding naturally. His many adventures are interesting, but personally I cannot get past the idea that a mouse is born to a human family even though I know this is fiction. [The Little family is unusual, but everyone seems to take it in stride.] A woman named Mrs. Frederick C. Little’s second son was a mouse. The article “Reading to Kids” includes discussion topics for this book before, during, and after reading and it also includes two craft ideas. You can read it here. Map work: Locate New York City and the East River. Make a comparison chart. Stuart lives in an urban setting but searches for Margalo in a rural area. Divide a chart in half. Label one column Urban and the other Rural. Find pictures of urban and rural areas and glue the pictures under the correct headings. “Family Values: Teaching Kids Respect” is an article that gives twelve tips/reminders for parents about teaching their children how to respect others. Stuart definitely looks different. This excerpt from an examination of conscience helps children reflect on how they treat others. Are there kids I will not play with or be mean to because they look different? Do I try to love all people, born and unborn? Stuart was a faithful friend to Margalo. Bible quotes about loyalty.